You are here: Home » Stunning Mediterranean House for Sale! Reduced! For Sale – a Traditional Spanish village house with terraces that have stunning sea-views – on the Costa Tropical, Andalucia, Southern Spain – 110,000€ reduced to €75,450. 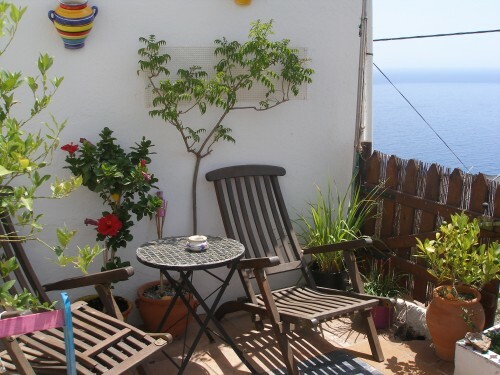 This is an unusual 2 bedroom terraced village house, situated in a tiny hamlet of 8 houses on a hill overlooking the Mediterranean sea, with sea and mountain views to the front and back. The Costa Tropical has a warm micro-climate with an average of 320 days of sun a year. Usually winters are very short (2-3 months) and it’s rare the day-time temperatures fall below 18C . The construction size of the property itself is 112 m² with 77m² living space (6 rooms). With outside terraces at the back of the house of 20 metres². Mains water and electricity (solar power is an option). we have a 3/4g Broadband Router Wimax, but ‘normal’ Telefonica telephone/broadband (and many other options) are available. Mains gas is not available so the cooker runs on butane bottles (bought locally). 80 litre Water Heater installed. Central heating is not needed but we have a Log Burning Stove. The house has very thick traditional walls to keep out the heat in the summer and keep it warm in the winter. The house is built on a hill so you ‘ascend’ up stairs as you go through the house to the terraces at the back. Council tax/rates (IBI) are currently 185€ per year. Very low outgoings, and the house has rental income or holiday home potential, or just come to live here permanently like we did 10 years ago! The local area is safe, relaxed and friendly. In July and August it is very busy with mostly Spanish tourists. This is a traditional Spanish area, it does not have the tourist mayhem of the Costas. Buyer will need to take legal advice and pay taxes (at least 10% of purchase price). Good offers considered. We sadly now need to move nearer to the coast for health reasons (we’re not leaving the area). You can see full details of our Mediterranean House for sale and photographs here! Let me know if you have any questions. Please contact me, if you’re coming to Spain, to arrange a viewing. !